"Yes, these are made with carrots! 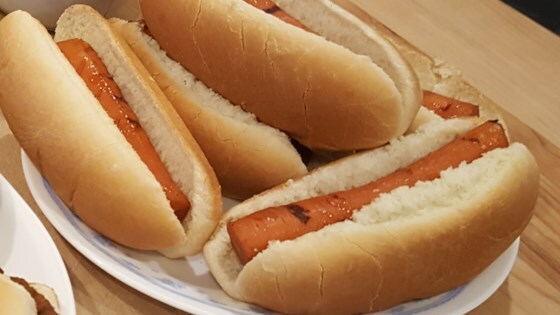 These vegan hot dogs are full of flavor and are perfect for the entire family. They can also be cooked in the microwave. Wrap them in a bun and top with your favorite hot dog condiments." Place a steamer insert into a saucepan and fill with water to just below the bottom of the steamer. Bring water to a boil. Add carrots, cover, and steam until tender yet still have a snap, about 15 minutes. Run cold water over carrots to stop the cooking process. Transfer carrots to a storage container. Whisk soy sauce, water, vinegar, sesame oil, ginger, garlic, and black pepper together in a bowl; pour over carrots. Cover container and refrigerate, at least 3 hours. The longer they marinate, the more intense to flavor. Remove carrots from marinade and place on the grill; cook until desired doneness is reached, 5 to 10 minutes. Instead of soy sauce, I used Bragg's liquid Amino's and I added a splash or 2 of liquid smoke. It turned out really good! Such a surprise! This was terrific; you can also cut the is pieces and eat them without a bun. Made exactly as directed even tough I'm not a fan of ginger. The marinade mix smelled delicious and would like to know What else it could be used with.